The designation outsider art was first introduced in the early 70's by art critic Roger Cardinal. The term was originally intended to be a synonym for the French term, art brut ("raw art" or "rough art"). Today it has grown into a broad new genre of art. The therm 'raw art' was created by French artist Jean Dubuffet. It was a reference to art created outside the traditional culture and channels of the art market. Initially it included art created by insane asylum inmates and children. Today, it has blossomed into a much broader meaning. Outsider Art: What is It? Often the term "outsider art" is used in reference to the self-taught and or naive artists. It includes those who do not produce and sell through the traditional art channels. Often those who are labeled as outsider artists do not have a relationship with the mainstream art world or art institutions. In the past, their work was discovered after their deaths. Outsider creations can reveal the extreme mental and emotional states of the artists. The unconventional thinking, the elaborate fantasy worlds or nontraditional media and materials are the hallmarks of outsider artists. The Outsiders have emerged to the point that there is now a museum dedicated to their works. The American Visionary Art Museum (AVAM) is America's official national museum and education center for intuitive, self-taught artistry. Additionally, an annual Outsider Artist Fair has taken place in New York since 1993. There are two regularly published journals dedicated to the subject. The term is sometimes misapplied as a catch-all marketing label for art created by people who are outside the mainstream "art world" or "art gallery system", regardless of their circumstances or the content of their work. Jonathan Steele creates both outsider as well as main stream art works. The Jonathan Steele Works creates a number of outsider works. Some have been new and innovative creations to the art world, such as carved bricks. Just as the art is created outside mainstream traditional art channels, the sales of these works often is outside normal channels. Most of the art is sold through outside art fairs such as one held in Baltimore Maryland at the SideShow Shop. Jonathan Steele creates both outsider art as well as main stream art works. 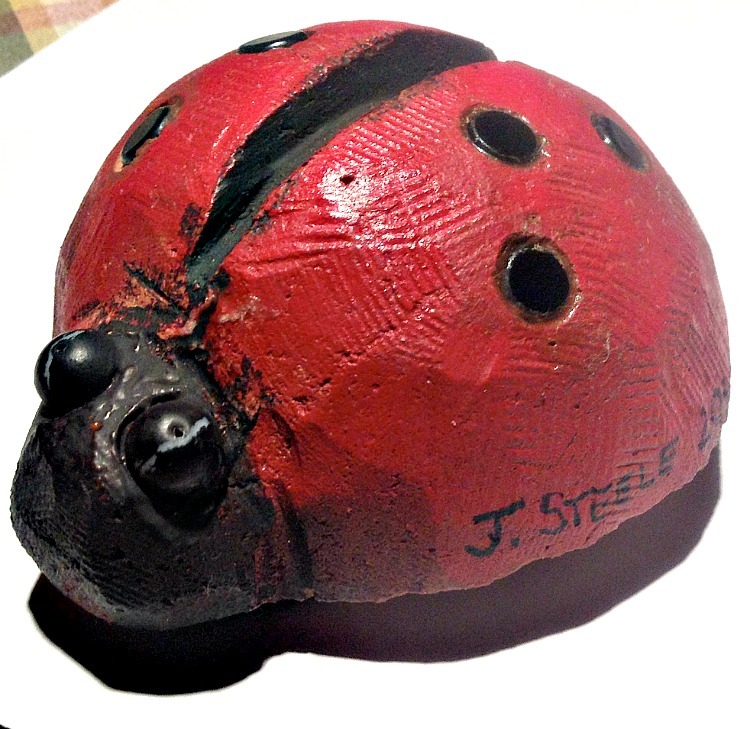 The Jonathan Steele Works creates a number of outsider art creations. Some have been new creations to the art world, such as carved bricks. Just as the art is created outside the mainstream of traditional art channels, the sales of these works often is outside normal channels. 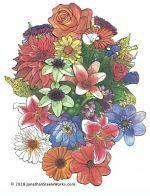 Most of the art is created by Jonathan Steele is sold through outside art fairs such as one held in Baltimore Maryland. Lady bugs carved from 100 year old red bricks. Discover how these came to be, how they are made and how you can get one for yourself. Combining found art and the outsider art bugs resulted in an new dimension to the bugs. Remember, outsider art uses unconventional materials. This is not only not conventional, it may have been one of the very first of the carved brick art ever made. If you are aware of any other, please let us know. On finding a heart shaped bottle in an old trash dump behind a country home, the thought occurred, what a waste of a perfectly good heart. Of course, only half of the heart was in tact. Once doing the bricks, it was obvious, the heart needed the brick and the brick needed the heart. So, it is erupting from the brick. This piece is designed to lay flat or to be stood up on its end. There is a felt liner on both the back and bottom to accommodate its various uses. 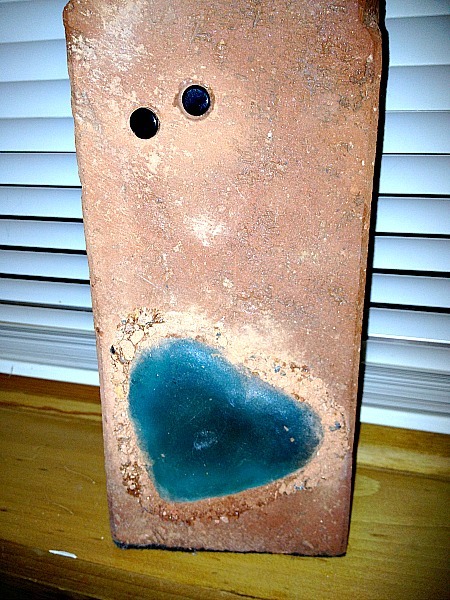 The Brick, an example of combining found art to create the outsider artistic creation.